Bus from Cameron Highlands to KL is one of the highly sought-after tourist routes connecting two famous tourist attractions in Malaysia, Kuala Lumpur and Cameron Highlands. 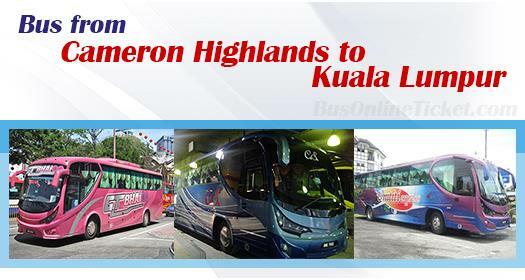 This is a direct express bus service from Cameron Highlands to KL. Modern coaches are deployed for this route by the only three bus operators. Coaches are with the full reclining seat and air conditioning environment. On top of that, sufficient leg space and thick seat cushion provides comfortable journey for passengers during the 4 hours journey. Unititi Express, The One Travel, CS Travel are the only three operators serving bus from Cameron Highlands to KL. Both Unititi and The One Travel are known for their comfortable spacious seats and legrooms equipped in the bus. Meanwhile, CS Travel also provides Wifi onboard to increase customer satisfaction. The schedule is usually from morning 8:00am until evening 5.30pm, with 1 to 2 hours interval between the schedules. Their bus fare ranges from RM 35.00 to RM 36.50 per ticket. The journey for bus from Cameron Highlands to KL is about 4 hours depending on traffic conditions. A washroom break will be provided upon request to the driver during the journey. Their departure point in Cameron Highlands is at Tanah Rata Bus Terminal, except for The One Travel whose coaches depart from hotels such as Brinchang Hotel and Copthorne Hotel. Besides that, Unititi Express and CS Travel also offer additional pick up points from their respective tourist information centres at Tanah Rata. Their tourist information centres are located at the start of Tanah Rata Main Street. Their arrival point in Kuala Lumpur is either at TBS (Terminal Bersepadu Selatan) or KL Sentral. KL Sentral is an integrated transportation hub in Kuala Lumpur where passengers can transfer to a monorail, LRT, and KTM to get to their next destinations. Only The One Travel drops off their passengers at Berjaya Times Square. The 1 hour downhill journey by bus from Cameron Highlands to KL is one of the most beautiful scenic roads. Nature lovers should not miss this view during the journey from Cameron Highlands to Kuala Lumpur. BusOnlineTicket.com is the sole ticketing portal which provides Cameron to KL bus ticket online booking service with instant confirmation for Cameron to KL bus ticket and seat selection features for Cameron Highlands related routes like KL to Cameron Highlands, Cameron Highlands to KL, Cameron Highlands to Penang and Penang to Cameron Highlands.